Limehouse Basin lies a few hundred metres to the west of Canary Wharf and can be reached from it by walking along the Thames Path. The Basin provides a link for boats between the River Thames and the Regent’s Canal, which runs from here through North London. 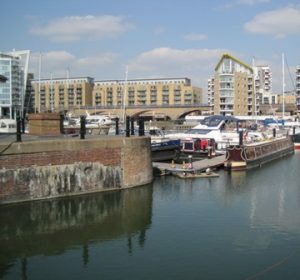 It also connects to the River Lea about 2 kilometres to the north-east via a short section of canal called the Limehouse Cut. When I first visited it in the early 1980s the basin, with its dilapidated wooden jetties and low rise warehouses, was eerily quiet in the way that only a formerly clamorous industrial site can become when abandoned. The railway to the north was disused and the road and river to the south had little traffic. Apart few a few gulls bobbing on the surface of the water there was little movement. Local fishermen spoke of a giant pike which had its home in the southwest corner of the silted up dock. Since then the basin and surrounding area have been redeveloped. Buildings of England refers to it as a wonderful site wasted with gimmicky housing, banal blocks and a ludicrous timber and brick pagoda for the Harbourmaster’s Station. The better housing has been added since the late 1990s. Many canal and river boats use the basin as a convenient mooring location. It provides easy access to the River Thames via a modern lock and to the country’s canal system via the Regent’s Canal and the Limehouse Cut. London’s canals provide safe and pleasant thoroughfares through the city without the hassles of the streets. 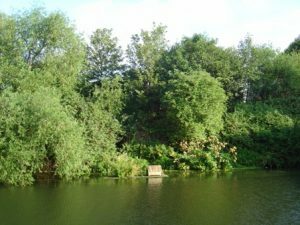 This quiet green world just inches from the bustling street life above is full of plants and wildlife including swans, herons, moor hens, ducks and the indomitable and territorial coot. There are entry/exit points at most bridges. Limehouse Basin is on the Thames Path and is a great starting point for walks along the Regent’s Canal (which is a branch of the Grand Union Canal) and the Limehouse Cut which leads to the River Lea and the Lea Valley. The walk along the Regent’s Canal is idyllic, passing as it does through three parks. There are also plenty of interesting places to stop off on the way. The starting point for walking along the Regent’s Canal is in the north-west corner of the basin and the towpath will take you the length of the canal through East London and then North London to Little Venice in Paddington where the canal joins the old Grand Junction Canal. The walk to Little Venice takes about 4.5 hours and is 12.8 kilometres long. On the way you will pass along the entire length of Mile End Park, along the south east edge of Victoria Park, through Hackney, Shoreditch, Islington, Kings Cross and Camden Town and along the northern part of Regent’s Park. 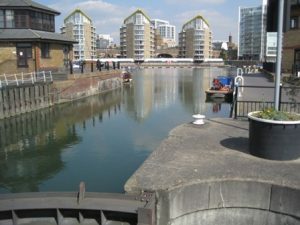 The walk along the Limehouse Cut canal starts in the north east corner of the basin and takes you to Three Mills on the River Lea about 3 kilometres to the north east. The towpath takes you under beautifully crafted brick bridges, past the Hawksmoor church of St Anne’s, Victorian warehouses and strangely contrasting modern apartment blocks, under the A12 on an award winning floating towpath and then past Bow Locks to the River Lea and Three Millswith its old tidal mills and pool. The two walks can be joined up to make a four sided circular walkwith a length of 9 kilometres: Following the Limehouse Cut walk stay on the towpath at Three Mills. Just after Old Ford Locks cross the canal on the footbridge to your left. This will take you onto the towpath of the Hertford Union Canal which runs west along the south side of Victoria Park. At the junction of the Hertford Union Canal with the Regent’s Canal turn left and the Regent’s Canaltowpath will take you south through the length of Mile End Park back to Limehouse Basin. The Limehouse Basin was built by the Regent’s Canal Company and opened in 1820. 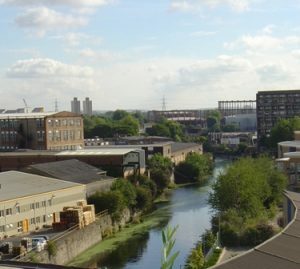 The Regent’s Canal provided a direct link between the River Thames and the Midlands and the main purpose of the basin was to provide facilities to off-load cargoes arriving from the Thames onto the canal for onward transportation. The basin’s heyday was in the mid 19th century when it was used to handle huge amounts of timber and of coal which was transported to gasworks and later to electricity generating stations. At one point the basin was the principal entrance from the Thames to the country’s canal network. The dock was linked by the Regent’s Canal with the Grand Junction at Paddington and was of immense importance to the economy. The basin was connected to the river by three locks – one for ships and two for barges, however its use declined with the growth of the railways and because the facilities were too small for the larger steam powered ships and the two smaller locks were closed. The Docklands Light Railway runs along the north of the dock along a viaduct built for the London and Blackwall railway, this was originally called the Commercial Railway and opened in 1840 providing a link from the City to the Blackwall river ferry which provided a service to Gravesend. The arches of the railway were engineered by Robert Stephenson and G P Bidder in 1840 to form the second oldest urban railway viaduct in the world. The carriages of the railway were originally rope hauled by stationary engines at either end of the line – steam was judged to be too much of a fire risk in view of the many timber yards and ropeworks the line would pass. However within 9 years the line had been converted to steam haulage. A 15 minute interval service was run and in the early 1850s some trains ran non-stop between Fenchurch Street and the Blackwall ferry covering the 3.5 mile journey in just 5 minutes. The line provided goods and passenger services until 1962 and the viaduct was unused for 25 years until passenger services returned on the Docklands Light Railway. 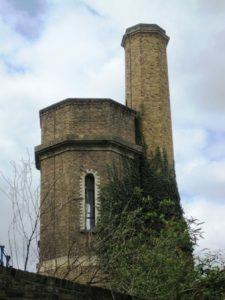 To the north east of the basin is an octagonal hydraulic accumulator tower. A steam engine forced pressurised water through hydraulic mains which powered the innovative coal handling machinery around the docks, it also powered the capstans, lock gates and swing bridges. The tower contained a giant piston which regulated the pressure in the hydraulic mains. The tower was restored in 1995 and a viewing platform installed on the roof for visitors. The tower is usually open for two days in September during the London Open House event (20 and 21 September 2014). Hydraulic technology was used extensively in the City in the 19th century for powering lifts and other machinery and it is possible that this was the first use of the new technology in the docks. Also to the north east on the roof of a church is a statue known as the “Steering Christ”. This was used as a navigational aid by sailors both on the River Thames and negotiating the narrow channels between ships in the docks. Coal jetties and low rise warehouses once stood around the basin but these are now gone largely replaced by speculative high-rise flats shoehorned into restricted sites.